The goal of Search Engine Optimisation (SEO) is to improve a website's visibility in the search engine's organic results an hence provide your site with increased relevant traffic. The first stage is to carry out some keyword research to identify the phrases people are searching for in your market and the amount of competition there is for each phrase. We'll then go onto look at your website to ensure that it contains the phrases identified and that it's been made in a search engine friendly way. Depending on how much competition there is for the phrases you've chosen to target, SEO can take a while to start to have an effect. This why we recommend a minimum term of 6 months for our SEO packages. Building your companies online presence will increase your importance in the eyes of the search engines and your position in their results will improve. We offer several SEO packages; more information on individual packages is below. We can also custom make packages to suit your individual requirements. On-page SEO – we'll optimise 5 pages from your website, ensuring your site is ready to be listed correctly by the search engines. Sitemaps – we'll produce sitemaps and submit these to the major search engines so they know about all the pages on your website. Website analytics – we'll set you up with Google Analytics to keep track on your website’s performance. 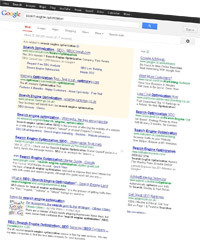 Webmaster tools – We'll set up your website in a Google and Bing Webmaster tools account. Google local business listing – we'll set up a Google local business listing for the business so you can appear in locally targeted results. Terranova offer web design and development services to customers throughout Glossop, Manchester, Tameside, Cheshire and Derbyshire from our base in Glossop in the High Peak. "I have found that the work Terranova have done for me on making a website and getting me high in the search engines has been my most cost effective marketing. Many of my new customers find me from my website and they often comment on the site and my work presented on it. I've tried several different ways of advertising my business but have found that my website is the most reliable method and gets me several good enquiries most weeks."